Over the last couple of weeks the 'West End of the North East' have been 'Puttig on athe Ritz' as the sensational touring production of 'Top Hat' arrived at the Wearside town of Sunderland, bringing more than a little touch of Hollywood glamour to the town's Empire Theatre. Fred and Ginger made this 1935 classic their own with wonderful songs from the pen of Irving Berlin such as 'Puttin' on the Ritz', 'Cheek to Cheek' and 'Let's Face the Music and Dance' in a Hollywood musical that was clearly designed to showcase their extraordinary talents. It takes some living up to, but this show did. With fabulous dancers and glorious costumes, the glory days of Hollywood were brought to life. I went to see the show last week and it simply didn't disappoint. What I hadn't realised before was that this show was a comedy – a classic Farce with threads of mistaken identity and the wrong people ending up in the wrong bedroom with the wrong partners while the main characters Jerry Travers (originally played by Fred Astaire) and Dale Tremont (Ginger Rogers' role) try to hide their attraction for on another in a series of one-liners, mishaps, coy remarks and put-downs - interspersed with wonderful dance routines performed by the lead dancers Alan Burkitt and Charlotte Gooch to a live orchestra. 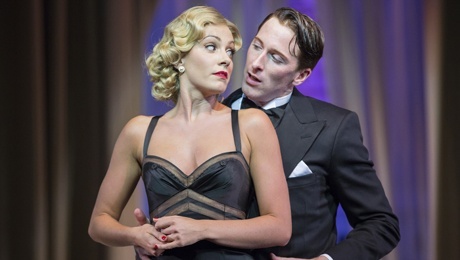 Having returned to the role after playing the parts in the West End, the leading couple made it look sooo easy. Also starring in the production are many originals from the West End, such as Clive Hayward as Horace Hardwick and Rebecca Thornhil, in her role as big spender Madge Hardwick. 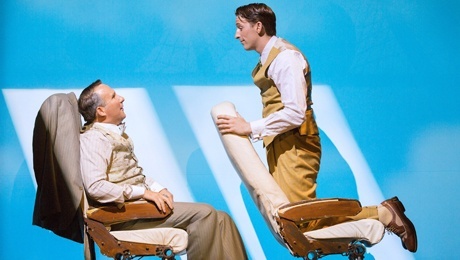 I make no apologies for referring to the original Hollywood musical extravaganza, this play is too famous not to – and this cast were up to the task – performing intricate dance routines with energy and aplomb. 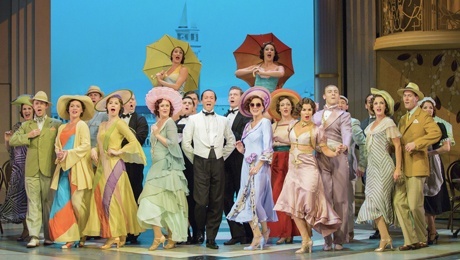 The scriptwriters even managed to incorporate Ginger's famously flippant remark who, when asked about Astaire's incredible dancing ability, retorted "I do everything Fred does - only backwards and in high-heels"
The multi-award winning show, with three Olivier Awards under its belt, is on tour around Britain for a few more months in 2015. but finishes its run at the Sunderland Empire on Saturday 4th July. Later in the year it starts a tour of Japan, beginning in Osaka, but you can still see it in the U.K. for a little while longer. Cick here for more information. This show simply exceeded all my expectations and - far from farcical – it was fabulous.